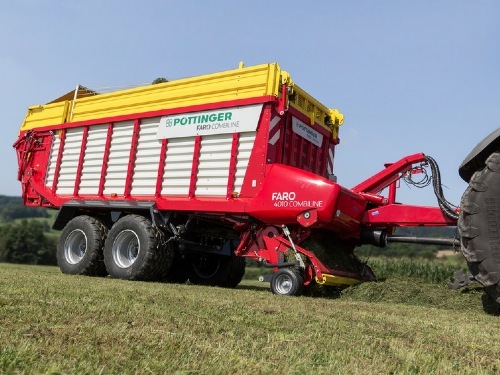 With the new FARO 5010 and FARO 4010 COMBILINE, PÖTTINGER offers you new models in the medium-capacity loader wagon segment for tractors between 90 and 150 hp. 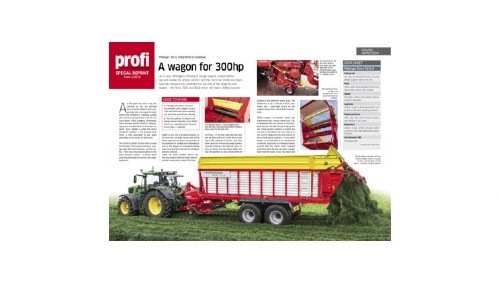 The 31 knife bank and powerful rotor drive for higher capacity make the new FARO a high-performance silage wagon. 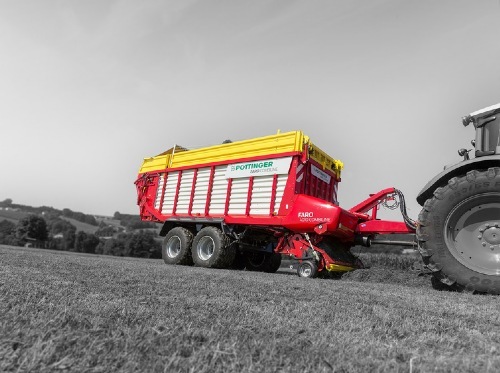 The FARO 4010 COMBILINE can also be used as a harvest transport wagon, turning it into a cost-effective all-rounder. Number of knives max. 31 pcs. 31 pcs. 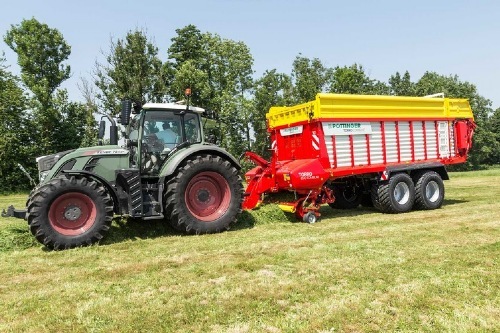 Depending on the type of tractor and the tyres fitted, a turning angle of up to 60° is possible thanks to the narrow design of the drawbar. The drawbar is implemented as standard as a hinged drawbar with two double–acting cylinders. A drawbar shock absorber is available as an option. All hoses and cables are routed tidily through the hose holder. A folding support leg makes it easy to attach and detach. A ball hitch coupling is available as an option. Load-Sensing system is also available. The frame components are constructed using high quality QSTE fine-grained steel. Frame and side pillars are fastened using finely threaded bolts – no welds. Closely-spaced pillars and high-strength side profiles ensure the highest strength. Width inside loading chamber 2.10 m.
On D models, the tailgate opening angle can be adjusted as required from the tractor seat. Access ladder and side door are standard on D models, optional on L models. Floodlights for loading chamber and work area available as an option. The driveline is designed for high outputs. FARO loader wagons are designed for use on tractors up to 150 hp. They are driven by a wide-angle PTO shaft and a cam-type clutch to protect the driveline. High torque protection of 1600 Nm. High performance power range from 90 to 150 hp. Loading rotor driven by 1 1/2 inch high strength simplex chain. A strong hydraulic motor provides the drive for the scraper floor, the speed of which can easily be controlled. A two-speed motor is available as an option for driving the scraper floor. The driveline to the beater rotors is concealed within the frame. The strong drive shaft is protected by a cam clutch at 1200 Nm. 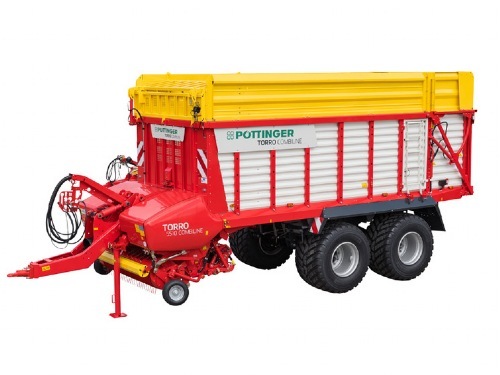 The PÖTTINGER pick-up guarantees maximum feed rate. 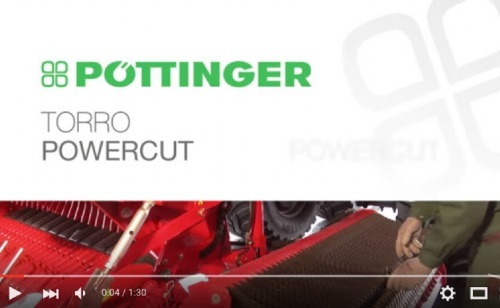 The transfer zone from the pickup tines to the rotor has been optimised and adapted to high throughput The PÖTTINGER floating pick-up, with six rows of tines, delivers impressive performance. 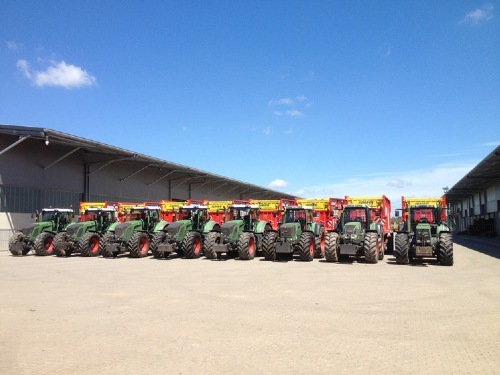 A reliable and high intake pick-up is still achieved at high forward speeds and in difficult harvest conditions. Two jointed support arms ensure the pick-up has complete freedom of movement. A spring alleviates the pickup weight so less pressure is exerted on the ground. To ensure perfect ground tracking and cornering, the 16 x 6.5-8 jockey wheels can be adjusted to ensure they make contact with the ground on precisely the same line as the tines. Trailed jockey wheels are available as an option. Automatic pick-up reel switch off on FARO D models with beaters. An additional tracking roller is available as an option. 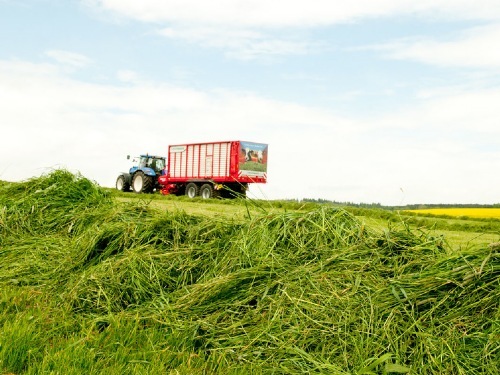 An optimised wind guard with swath roller and guide plates ensure perfect forage flow with every type of crop, even at high loading speed. The sealed twin-race roller bearings on the cam rollers are designed to withstand high stresses. The pick-up tines are controlled in a sweeping arc. This results in optimum protection of the sward, lower levels of soil contamination and prevents unnecessary wear to the tines. The pickup is controlled from both ends by a steel cam track. Because the pick-up controls the movement of the tines, the crop is brought closer to the rotor tines, which is a real advantage with short, wet grass in the autumn. This newly-developed additional tracking roller is located behind the middle of the pick-up on PÖTTINGER loader wagons. Being located in the centre prevents it from sinking into tractor wheel marks and as a result guarantees perfect ground tracking and clean forage. ROTOMATIC PLUS is the heart of the FARO range. Rugged and powerful, the rotor delivers high output chopping and compression. 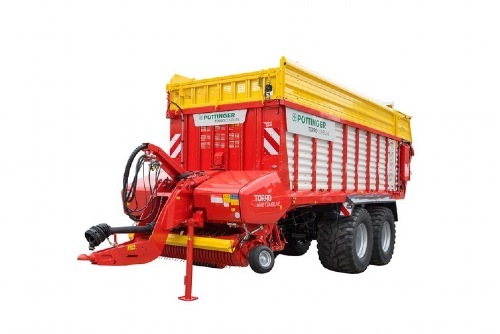 ROTOMATIC PLUS stands for smooth, efficient chopping of the crop and perfect transfer from the pick-up. The loading rotor has seven rows of tines arranged in a spiral with a diameter of 750 mm. The bearings are located on the rotor frame between the rotor and transmission to protect the bearings and drive chain. The conveyor tines made from hardened Durostat 500 fine-grained steel are 7 mm thick and ensure maximum performance, even with short, wet forage. The optimised tine shape and large scraper surface ensure the best possible compression in the loading chamber. The tine rings are hooked into the central drum and welded around the circumference for exact positioning. The scrapers have an 12 mm wide rear face and are individually mounted and bolted. They ensure highest possible compression, depending on how the automatic loading system is set. 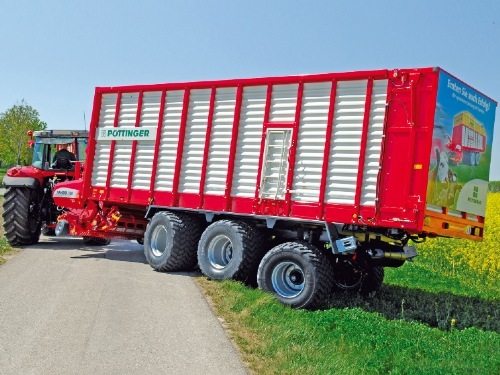 The unique solution from PÖTTINGER: The EASY MOVE knife bank swings out alongside the wagon to ensure ease of use. Change knives conveniently at the side of the wagon. 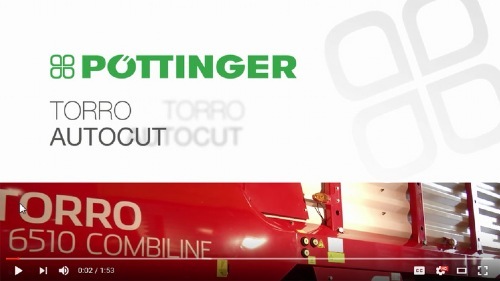 PÖTTINGER protects the heart of the silage wagon with an innovative device: the patented foreign object protection system. This device ensures that each knife is individually protected from damage. High output requires an adapted trigger pressure. Powerful springs securely hold each individual knife in the correct position to ensure an even chop. Where PÖTTINGER stands out: The trigger pressure for wagon knives reacts differently to a foreign object depending on its size. Smaller foreign bodies fall through between the pick-up and the rotor. Larger foreign bodies are pushed by the rotor onto the knife and move it briefly in the direction of rotation. The trigger roll at the back of the knife is lifted out of its holder and the knife releases the foreign body. The resistance is minimal when tripped, which protects the knife. After the object has passed through the chopping system, a spring pivots the knife back into its original position. Unlike a harvester, this system does not pulverise stones. 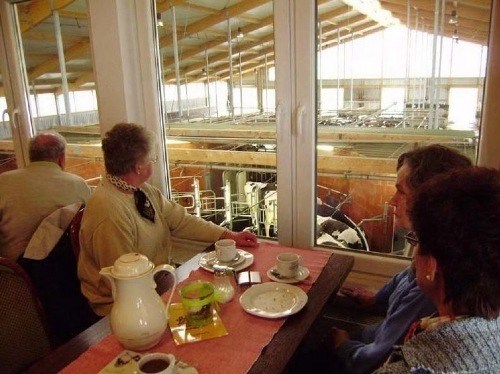 As a result, the cattle leave foreign objects in the trough, preventing injuries to the digestive system from ingestion. A press of a button on the terminal is all that is needed and the full cross section of the tailgate opens to unload FARO L and D models in a few minutes. The automatic unloading system makes life easier for the driver and protects the machine. The scraper floor has been lowered at the front by 150 mm to accommodate tyres up to 710/35 R 22,5. 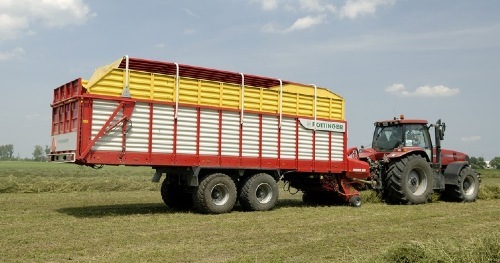 The forage is pushed upwards as it moves to the rear. This ensures smooth, uniform unloading with a low power requirement. Powerful drive chains ensure rapid unloading. A two-stage motor is available as an option for unloading speeds of up to 18 metres/min. 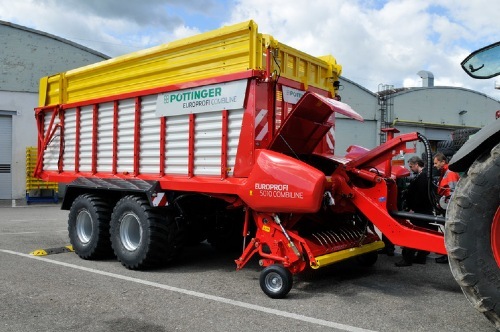 All PÖTTINGER loader wagons are load sensing compatible. The required oil flow rate is precisely measured and adjusted to demand. This prevents the oil from heating up and saves power by up to 15 kW / 20 hp. Beater driveline protected to 1200 Nm. Dedicated on-board hydraulics with flowrate of less than 80 l/min. These operator terminals provide the tractor driver with a well-deserved level of support to ensure efficient and consistent productivity. 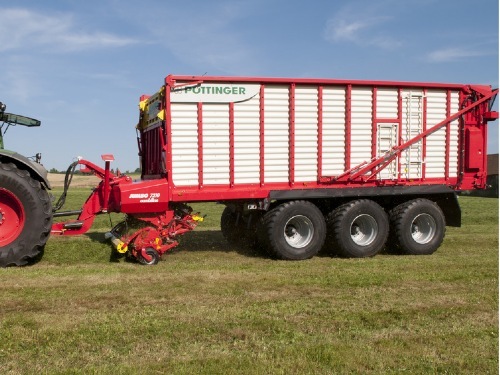 Pöttinger's new generation of in-cab terminals make sure you have everything under control, even after a long day in the field. The development of the terminal focussed on maximum operating convenience, ergonomics and automation of each working step. The intuitive layout is especially useful if there is a frequent change of drivers. The result is a range of control systems to suit your equipment, from electronic preselect controls through to fully integrated ISOBUS terminals. Heavy duty 2-component synthetic casing with rubber edge guard. All units feature an illuminated graphic display. Raised back-lit keys for optimum visibility at night. 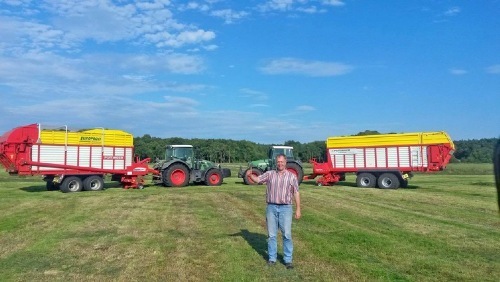 All functions can be selected directly on wagons without unloading beaters. The brightness of the graphic display and illuminated keys is adjustable. Ergonomic layout of control keys. Specially for operating the cross conveyor belt. A carry-belt keeps both hands free. Wide range of up to 100 m.
High-end operating convenience as an option. A universal control terminal, compatible with all ISOBUS machines from PÖTTINGER and other machinery manufacturers, is also available. High quality 8.4" TFT colour screen with back-lit keys. Touchscreen, automatic functions for loading and unloading. USB interface, M 12x1 camera connection. Suspended tandem axle with parabolic springs, 10.5 t axle load, 17"
Standard on FARO 3510 / 4010. Nine large parabolic springs provide the necessary suspension to reduce compression on the ground. The compensating linkage distributes the pressure exerted on the ground evenly between the two axles. The springs are 1100 mm apart. When driving over rough ground, the forces are split evenly to both axles instead of being accommodated by shock absorbers. 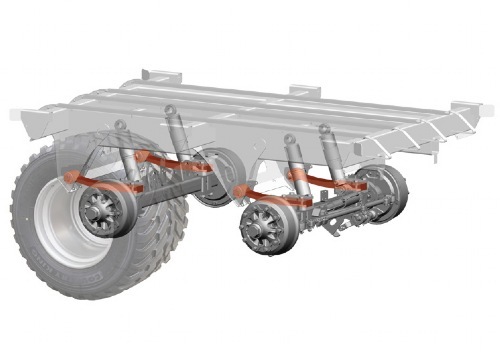 Tandem axles with parabolic leaf spring suspension, 13 t axle load, 17"
Standard on FARO 4510 / 5010. 22,5" Standard on FARO 4010 COMBILINE. Parabolic springs with large spring–to–axle spacing and compensator to cancel out swaying. Tandem axles with parabolic spring suspension and longitudinal linkage, 16 t axle load, 22,5"
Compensator arm to cancel swaying. Strong trailing linkages apply the braking and steering force. 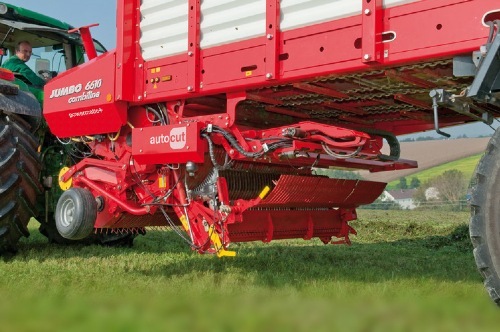 This ensures smooth running in the field and on the road as well as perfect suspension while unloading in the clamp. No damage to sward, even with really heavy loads. The ISOBUS terminal automatically locks the trailed steering axle at high driving speeds and when reversing. 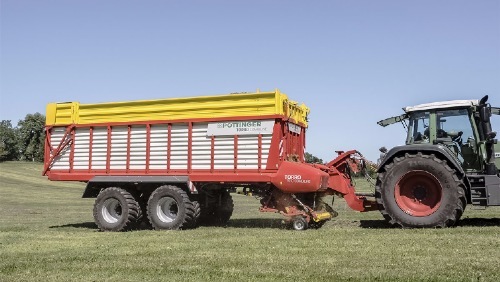 Tandem axles with hydro-pneumatic suspension and trailed steering axle / 16 t axle load, 22,5"
The large axle compensation of up to 220 mm is designed to handle challenging field entrances and poor track conditions. The four wheel air brake system with automatic load-dependent braking system (ALB) ensures safe and smooth braking at high speed. Hydraulic brakes can be supplied dependent on local legislation.